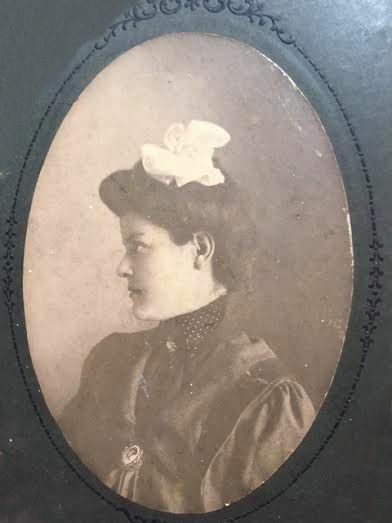 My great grandmother was born 131 years ago on April 17th. I was fortunate to have spent lots of time with her growing up and I have many memories of her. This is her wedding picture from 1902. One source says she was married in 1901 but suffice it to say, she was a young bride by today’s standards. She had four beautiful children whom she loved dearly. She talked about them lovingly while we sat with her under the giant oak trees shading her front lawn. She was a woman of contrasts. She was gentle yet feisty. She was tiny but strong. And she was generous yet thrifty. She was also serious but fun-loving. I remember one year at Christmas when we all piled in her cozy house, she had a punch bowl on the kitchen table. When we finally served enough punch to reach the bottom of the bowl, there were three very large nails in the bottom. She then announced that she had “spiked” the punch. We enjoyed her pun and it obviously made an impression on me as a youngster that it is fun to be witty, jovial, and light-hearted. To contrast her jolly side with her serious side, it was clear that she loved the Lord and would memorize entire books of the Bible and recite them in church. She enjoyed worship and praise and it had to be an insurmountable problem to keep her from going to church. Even then she would turn on a televangelist and worship from home. Grandma was my first inspiration for a love of home arts. She sewed, canned, cleaned and kept house. She made us all feel welcome and patiently played with each great grandchild even when we were on our umpteenth game of bingo or cribbage. Lately I was reading through some journaling questions and one of them asked who was a favorite relative and do we currently exhibit some of the qualities we admired about him or her. My great grandmother is certainly high up on my list of favorites and I can only hope that someone who knew her could see a bit of her in me – a worthy goal, for sure. My great grandmother loved sweets starting with the pink wintergreen candies she always kept in a jar on her desk and including the soft sugar cookies she kept in her kitchen and finally the assurance that she would always buy us a nickel pie from the bread man as he made his rounds. I think this cake would have been perfect. Happy Birthday, Grandma! Preheat oven to 325 degrees. Grease and flour a bundt pan. (I “floured” mine with cocoa powder to keep from turning the crust white with flour). In a large bowl, cream together the butter, sugar and vanilla until fluffy. Add eggs one at a time and beat until creamy. In a separate bowl, stir together flour, baking powder, and cocoa. Add to creamed mixture alternately with the half-and-half. Place batter in the prepared bundt pan and bake for 80 to 90 minutes. Allow to cool 10 minutes in the pan before removing to a wire rack to cool completely. Pour glaze on cooled cake. 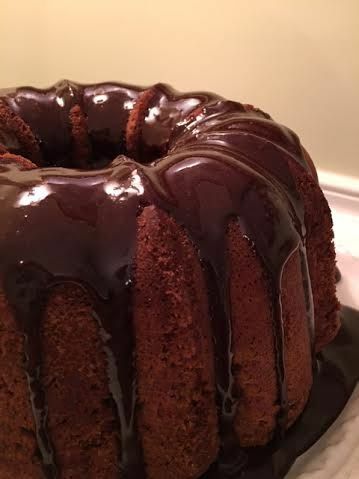 Glaze: 1 1/2 cups sugar, 1/2 cup cocoa, 7 tablespoons half-and-half, 1/4 teaspoon salt, 4 tablespoons butter, 1 teaspoon vanilla. Place all ingredients except vanilla in a heavy saucepan. Bring to a rolling boil stirring constantly. Allow to boil for two minutes. Remove from heat and stir in vanilla. Allow to cool slightly before pouring over cooled cake. Needless to say, I love this blog about Grandma…she was the best…we all loved her. Every word is true! She was one of a kind and I still miss her!